Stallman Was Right: Ello, Facebook, and Freedom. It’s ello time. And now that we’re in day 2 of ello-mania, some smart articles are popping up. Cayden, I think you’re on the right track on a lot of what you say. I especially like how you tied together the critique on funding (which should get a LOT more attention! ), design, and privacy all together. Your closing thought is also strong — wish you had taken a few more extra steps though! I wonder where you would have ended up. 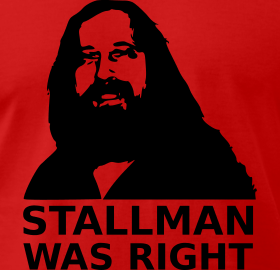 As I said over at Max’s, this whole set of facts is further confirmation of an evergreen saying: “Stallman was right”. As organizers, we are trained to think about power. When talking about the economy, when talking about interpersonal relationships, reading the news (“who benefits from this coming to light *now*?”), even when talking about literature or pop culture. That’s the mark of a good organizer — being able to see deeper. Yet when it comes to the ever-increasing part of our lives that is mediated through screens and processors, all too often we are faced with people’s tendency to shut down that part of their brain. We know what the good solution to facebook would be — owning our own data. Writing comments directly on a blog post instead of on the facebook share linking to it. Placing our lives and content on servers and programs (wordpress, media goblin, rails, jekyll, etc) that we control. Shrinking the sphere of social media to sharing links to value instead of hosting value itself. At least, that’s part of the solution. And something we can actually do now, without assuming a legion of technical help. We do have the tools to break free. At least partially. Here’s hoping that Future Me spends more time over here, blogging in the independent democracy of Sahar’s Server, rather than over there, in the Facebook Fiefdom. Posted on September 25, 2014 Categories Misc, PersonalTags Cayden Mak, Ello, Facebook, Future of the Internet and how to stop itLeave a comment on Stallman Was Right: Ello, Facebook, and Freedom.